Quality, not quantity! Our inventory of cows is the culmination of a carefully planned breeding program, as well as an ongoing search for the best breeding stock in the industry. Utilizing a small number of quality cows, we strive to breed our cows to their fullest potential. The result of this hard work is the creation of a herd of cattle that can work throughout the entire industry. Breeding stock purchased from other breeders is among the finest in the industry. Atterbury pasture. Spring herd. Confirmed bred at this time. Atterbury Pasture. Spring herd. Confirmed bred to Top Caliber at this time. Atterbury Pasture. Spring herd. Confirmed bred to Phenomenon at this time. Atterbury Pasture. 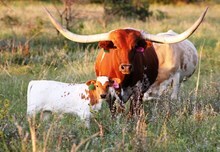 Peaches is a great mother-gives plenty of milk, is very easy to handle and she's by the great Iron Mike bull. Very solid-body. Nice cow! Spring herd. Atterbury Pasture. Lots of horn provided by ZD Kelly. Strong genetics. Gentle cow. Spring herd. Confirmed bred at this time. Bellview Pasture. Love this cow's temperament, swoop horns and conformation. Fall herd. Confirmed bred to Fifty Fifty BCB at this time. Atterbury Pasture. Big, thick bodied cow! Almost 70 inches of horn that has a beautiful twist. Excellent udder and mothering ability on this cow. Fall herd. Confirmed bred at this time. Atterbury Pasture. Spring herd. Confirmed bred to Boomerang at this time. Atterbury Pasture. Gail produces incredibly good offspring that are very correct and they are show/futurity winners. This is a great cow with lots of production ahead of her. Confirmed bred to Rocky at this time. Spring herd. Bellview pasture. Fall herd. Confirmed bred to Bandera Chex at this time. Bellview Pasture. This young cow carries great genetics top and bottom. Her sire is the 80"TTT Mustafia EOT. Fall herd. Atterbury Pasture. Large bodied, wide horned daughter of Zabaco, out of a Shadowizm daughter. Big, thick brindle cow that's an excellent mother with a good udder. Spring herd. Atterbury Pasture. Blue Belle is an awesome mature cow. Sired by multi-horn showcase winner, Starbase Commander. Spring herd. Confirmed bred at this time. Bellview Pasture. Young Sittin Bull daughter. Excellent horn and good mother. Fall herd. Atterbury pasture. Beautiful dark brindle cow by a LLL Lucky son with Brazos Chex on the bottom. Very calm, sweet cow. Spring herd. Atterbury Pasture. She is an excellent mother and will mature to be an excellent foundation female. Confirmed bred at this time.. Spring herd. Atterbury Pasture. Excellent cow! Beautiful brindle with a fully functional bag. This cow is a milker who produces! Spring herd. Confirmed bred at this time.